A woman watches as police investigate the shooting death of 14-year-old Tommy McNeal on September 20. Chicago is on pace to see its fewest murders in a half-century, officials said, marking a major turning point just one year after the violence-plagued city logged 500 homicides — the most of any city in the country. In a city that in recent years has been torn apart by brutal gang slayings and bloody street scuffles, shootings are down 25 percent and overall crime is down 15 percent compared to the same reporting period in 2012, according to Collins. 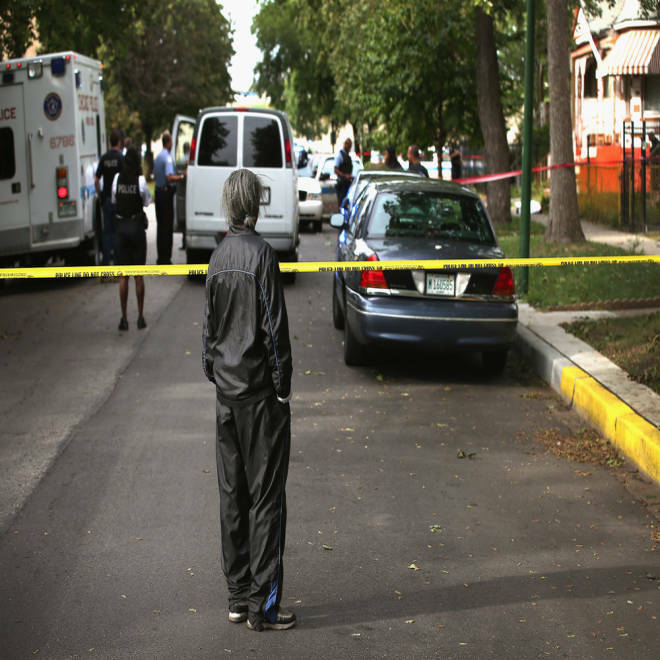 By midnight on Nov. 30, Chicago had seen a total of 1,712 shootings (a drop from 2,291 in 2012). "We're doing a lot better than we were doing before," Police Superintendent Garry McCarthy told NBC News. "Very significant work is being done by the men and women of this police department." Meanwhile, authorities have also made headway in the fight against illegal gun possession. In the last 11 months, police recovered a staggering 6,372 illicit firearms, McCarthy said. McCarthy told NBC Chicago that stemming the city's murder rate is tied to putting a lid on the number of shootings. Earlier this year, Chicago was beset by a spate of gruesome murders that made the city synonymous with gun violence in the eyes of many Americans. The carnage made the city a crucible in the hot-button nationwide debate over the prospect of new state and federal gun control legislation following the shooting deaths of 20 young children and six adults in Newtown, Conn. In January, Hadiya Pendleton, a 15-year-old Chicagoan who performed at President Obama's second inauguration, was gunned down by a man just a mile from the president's South Side home. Jonylah Watkins, a 6-month-old baby, died in March after being shot five times while she was sitting in her family's parked minivan in the city's Woodlawn neighborhood. And in September, an assault style rifle with high capacity magazine was used in a park shooting that wounded 13 people, including a 3-year-old child.